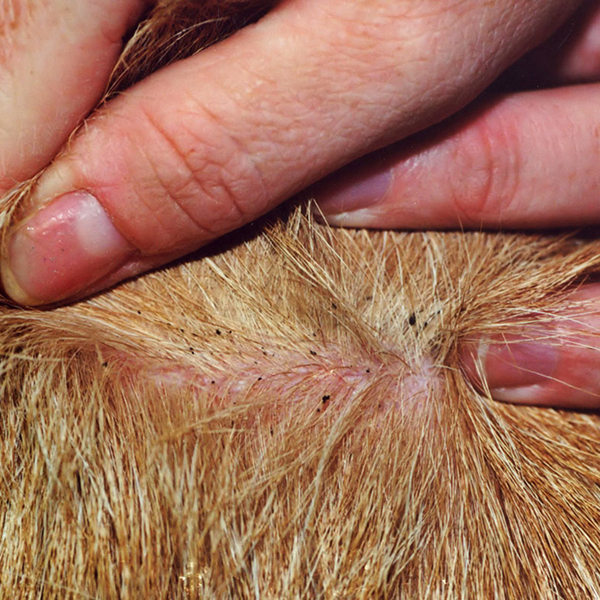 Have you been noticing your pet itching and scratching more and more? Is their skin getting red and bumpy? You and your pet are not alone! Unfortunately there is no quick answer to this, but things that could be factors are allergies or fleas. Call us and we can get you set up with an exam with either of the Doctors to find out exactly what is going on with your pet. First thing to eliminate, is if your pet has fleas or is having a reaction to flea bites. Check your pet over from head to toe for small blackish/brown bugs (that are very fast moving and hard to catch!) If you don’t see fleas but see areas with black dirt..you are seeing what is called flea dirt and unfortunately your pet has fleas. The most common areas they hang out is the base of the tail, up around ears, and the neck. Don’t panic! We can get you through the process of getting rid of them. We will get your pet started on flea medication, either a topical or an oral. There is an option for an injection for cats as well. Activyl, Bravecto, and Effipro are just a few of the great options. We will also walk you through how to get the household rid of fleas and their eggs. We have a spray for the house, as well as some bombs. We know it is all pretty overwhelming, so let us know if you have any questions or concerns. We have plenty of options to help solve your pets allergy issues. Antibiotics & medications, as well as prescription food for any food allergies. This entry was posted in Uncategorized and tagged #cytopoint, #fleas, #petswithallergies. Bookmark the permalink. Follow any comments here with the RSS feed for this post. Comments are closed, but you can leave a trackback: Trackback URL.